Received wisdom is that dipoles should be high and clear of any obstructions but this is not always possible in an emergency communications environment. We also know that the lower to the ground a dipole becomes then the more losses are incurred in the system dropping overall efficiency. 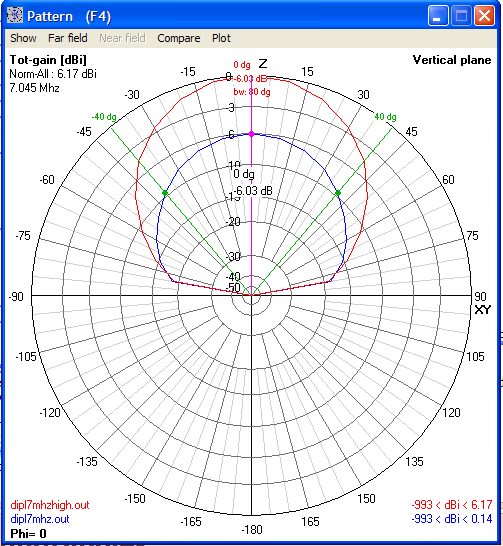 The importance of grounding is not lost on vertical antenna users who go to great lengths to improve their ground systems to reduce losses and lower the angle of radiation for Dx working the question was whether such an approach was worth following for low horizontal dipoles. While lowering dipoles nearer to the ground improves the ‘Near Vertical’ radiation pattern we seek for NVIS use it was usually at significant cost in ERP 🙁 Would the use of ground wires be able to mitigate the effects of lowering the antenna ? Some RAYNET-HF members and SOTA operators had already found some success in erecting dipoles in the field over existing barbed wire fences and reported an increase in gain and it was thought that by using computer modelling for a very low mounted dipole the effects of the ground wires would be most apparent. To benchmark performance two models were constructed using NEC to compare a dipole notionally on 7MHz erected at heights of 7 metres and 2 metres representing heights achievable with fibreglass fishing poles and farmers electric fence posts respectively. The results are shown in the graphic below. The low dipole (dipl7MHz.out) shown in blue is nearly 6dB worse than the dipole erected at 7metres agl with ‘normal’ earth beneath the antenna. This is the target difference to remove if possible by the use of ground wires. A series of models were then constructed in NEC using a dipole at 2m agl with respectively one, three and five ground wires running parallel to the dipole but at a height of 10cm above ground and separated from each other by 1m separation. The length of the wires was the same as the dipole since I thought that by increasing the length slightly to provide a ‘reflector’ effect I could also introduce errors into NEC which can give erroneous results if the segments of closely spaced wires do not align correctly. The spacing of the ground wires above ground was also an attempt to avoid a known NEC problem. The results of this second modelling run are shown below. The different models were named dipl7mhzXgw.out where X is the number of ground wires. The single ground wire case is therefore for a dipole 2m above ground with a single ground wire below it 10 cm above ground. The three ground wire case has two additional ground wires added 1m either side of the existing ground wire etc. 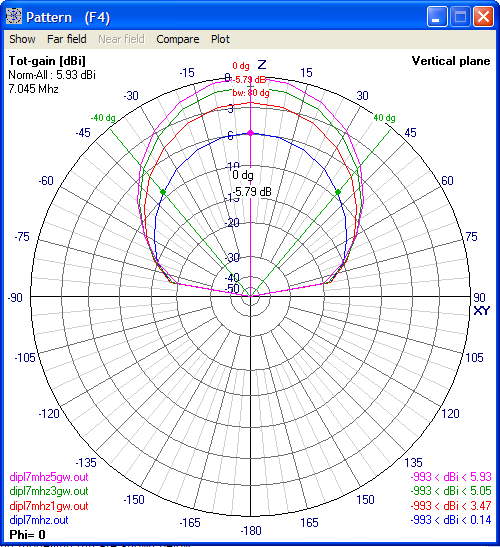 The addition of a single ground wire improved the performance of a low dipole by 3.33dB, using three ground wires produced a 4.91dB improvement and five ground wires an increase of 5.91dB over the low dipole alone not far short of the 6.17dB difference obtained by elevating the dipole from 2m to 7m. Adding more than one wire beneath the low dipole improves vertical gain, the addition of just a single wire sharpening the vertical radiation pattern from 80 degrees to 60 degrees beamwidth. Where the only possibility for erecting an NVIS antenna is on low supports then the use of ground wires should be considered to squeeze the most from the antenna.